Peter Cushing. Robert Urquhart. Hazel Court. Christopher Lee. Medical. Dave T's Platinum Picks. Science Fiction. Horror. Recommended. Hammer Horror. 01 Ade tastics. In prison and awaiting execution, Dr. Victor Frankenstein recounts to a priest what led him to his current circumstance. He inherited his family's wealth after the death of his mother when he was still only a young man. He hired Paul Krempe as his tutor and he immediately developed an interest in medical science. After several years, he and Krempe became equals and he developed an interest in the origins and nature of life. After successfully re-animating a dead dog, Victor sets about constructing a man using body parts he acquires for the purpose including the hands of a pianist and the brain of a renowned scholar. 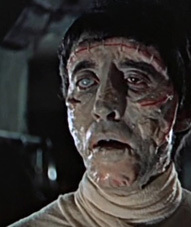 As Frankenstein's excesses continue to grow, Krempe is not only repulsed by what his friend has done but is concerned for the safety of the beautiful Elizabeth, Victor's cousin and fiancée who has come to live with them. His experiments lead to tragedy and his eventual demise.